Wednesday May 2nd and Wednesday May 30th we have organised two evenings of North Sails Mixed Dinghy Downwind Training. This is sponsored by North Sails Ireland so will be free of charge. The plan is to be rigged and ready at 6.30pm sharp! 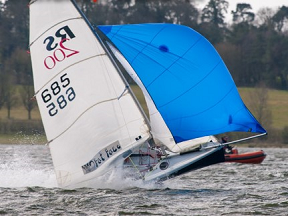 Coach for both evenings will be Nigel Young from North Sails Ireland. Nigel has been sailing in Asymmetric boats since 1994 so he has a rough idea of what it’s all about! If you would like to participate in this free event please fill in survey here North Sails Downwind Clinic Survey . This survey is important to gauge the number of safety ribs that will be needed. May 19th and 20th is the Royal Sprints event in the RCYC. It is an open event and if you have not done so please register at: Royal Sprint open event- RCYC so we can get an idea of numbers participating. June will be Skills for gold coaching and the survey for this will be advertised in due course. This is an excellent months coaching for all dinghy classes so I would encourage all of you to participate. This year we would like to put a big emphasis on dinghy racing in the Club and would encourage everyone to get out on the water for Wednesday and Saturday racing. There will be rib support available. The Wednesday evening Mixed Dinghy racing starts 6th June– first gun at 18.25.